Terminal Velocity Aerospace technicians work on the RED-4U capsule prototype, which carried stem cells 20 miles (32 kilometers) into the sky for a space-readiness test. 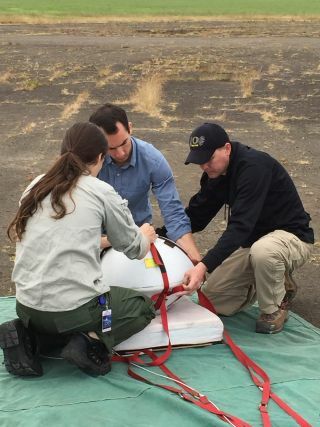 Despite a rough landing, stem cells riding in a prototype capsule survived a long fall back to Earth during a drop test — part of an initiative to research the cells in space. The RED-4U capsule was created by Terminal Velocity Aerospace (TVA) to return science experiments to Earth and carried a cargo of adult stem cells, which can grow into any cell type. The cells, provided by the Mayo Clinic, are thriving despite a parachute's deployment issue, the company's CEO said. The failure's cause is being investigated, but is not related to the parachute design. An illustration of a Terminal Velocity Aerospace RED-4U capsule returning to Earth by parachute. During the recent test flight, which was primarily aimed to demonstrate low-cost communications systems and electronics, the balloon carried the capsule to a height of about 20 miles (32 kilometers) before descending on a similar trajectory to something returning from space. TVA plans to fly a RED-4U capsule in space in the coming years. The flight test was funded by NASA's Flight Opportunities Program and used a balloon from Near Space Corp. The Mayo Clinic has a $300,000 grant from the Center for the Advancement of Science in Space (CASIS) to develop techniques for growing stem cells in space, but a flight date has not been announced. CASIS manages the International Space Station U.S. National Laboratory. A high-altitude balloon lifted the prototype space re-entry capsule high into the air for a flight test. TVA also tested a technology known as ADS-B, a new flight protocol that allows airplanes to get "situational awareness" about other flights. The Federal Aviation Administration plans to use ADS-B to supplement traditional radar tracking and perhaps replace it. With ADS-B, a RED-4u capsule returning from space would need only a minimum of ground support for tracking, DePasqaule said. The new research lays the groundwork for getting a capsule ready for space. Ground testing and more parachute tests are planned before this next step, which could see RED-4U soar beyond Earth in one of two different ways: as an International Space Station payload, or as an independent satellite that launches aboard a yet-to-be-determined rocket. TVA is also working on several products to transmit spacecraft information, such as RED-Data, which gives more information about how a spacecraft behaves during re-entry. In 18 months to two years, TVA plans to fly a RED-Data package aboard a space station cargo vehicle that breaks up during re-entry; the specific vehicle hasn't been selected yet. The company was founded in 2012 and serves organizations that "are interested in the idea of space-based research and small payload return," DePasquale said. With three principals, four full-time employees and several contract workers, the firm is profitable and has slowly growing revenues, he added.